A pink, simple berry cake with puff pastry layers and filled with whipped cream, a light tasting cake to impress your Valentine. I love this kind of puff pastry cake. Easy to make, you don’t even have to make your own pastry, few ingredients but maximum of taste. Not too mention it looks quite good, good enough to impress any guest. Like I’ve mentioned in my previous post Romanian Crescent Rolls- Cornuri simple, Valentine is not exactly a big thing in Germany, but still I like to make something nice for my husband and I (and the kids, they are always included) to celebrate this day. Even if I think that the Valentine Day is mostly there to earn money for the chocolate and flower industry, something extremely commercially pushed, I still think that any occasion to think of and to celebrate love should be acknowledged in one way or another. There is so much sorrow and pain in this world, that if only for one moment we could think more of love than of pain, we still have something to gain. 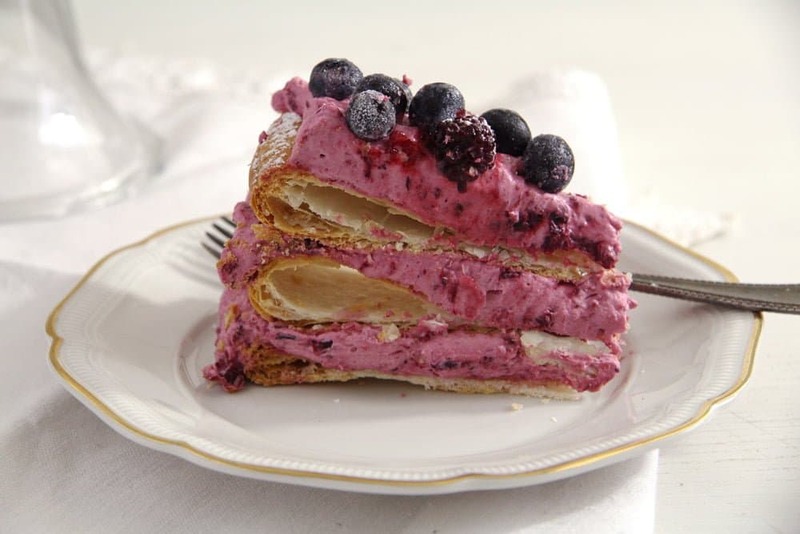 This recipe for this berry cake with puff pastry is not exactly a typical Romanian cake, it is more of a modern approach on Romanian cooking. My grandmother didn’t use puff pastry in her kitchen (well, she didn’t bake much cake to start with), ready-made puff pastry was not available during those times and to make your own puff pastry is really quite a pain …. one of those challenges I still have to master. What makes this berry cake Romanian is the memory of my grandmother’s berries. I remember vividly how happy she was the time she could afford to buy a second-hand freezer, a huge loud thing that stood in the corner of the kitchen, behind the door. She laid a small lace tablecloth on it, put a small bowl as decoration on top of that and was so proud. We might have had some frozen meat in the freezer at times, but what I mostly remember are the berries. I remember us going picking blueberries or wild strawberries a couple of times, otherwise she would buy the berries at the market in summer and freeze huge bags full of them: raspberries, blackberries, blueberries and so on. 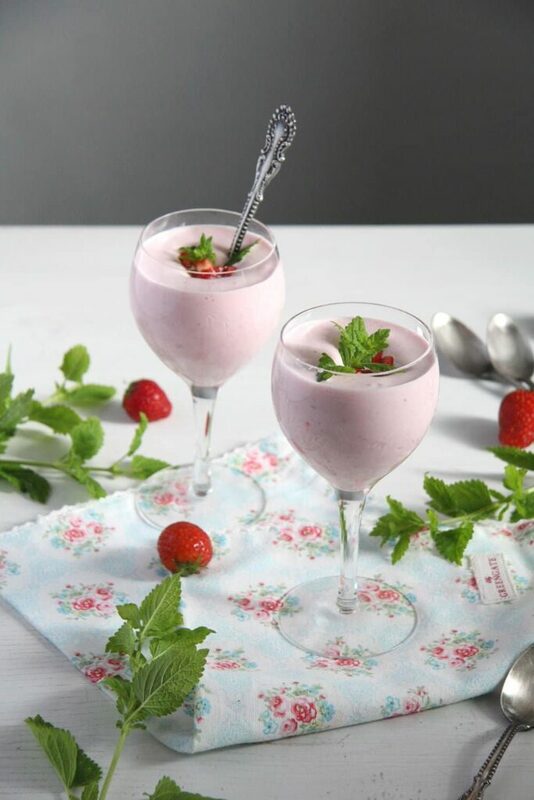 She would then use them to make something similar to this Romanian Strawberry Foam or my birthday tart in April or we would just eat them like that: defrosted with a little sugar. Or one of her sisters (who didn’t have a freezer) would pick up some and make one of those delicious Romanian meringue berry cakes, sweet and tart and so delicious. 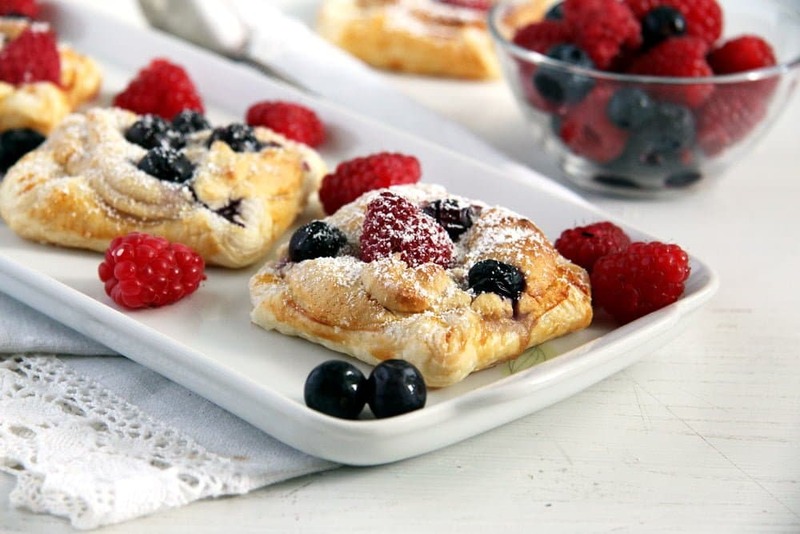 I used one packet of puff pastry to make this refreshing tasting puff pastry cake with berries. I cut out two 24 cm/ 9.4 inches out of them, roll the rests together and cut out a third circle of the same size. If available, you could buy the puff pastry that is already rolled into circles. I used good quality unsweetened double cream for the filling which I stabilized with Dr. Oetker Sahnesteif (Whip Cream Stabilizer) For Whipping Cream (12 (4 x 3 bags)) , you can use that stabilizer or a similar product available where you are. Cream stabilizer is not always necessary, you will have to decide yourself if the whipped cream is stable enough or not. The heavy cream in Germany needs it otherwise the whipped cream will be too soft, but I remember that I did not need any when living in England and as the product is not very well-known outside Germany either, I assume that you would not need it in most countries. Cream stabilizer can be replaced with a mixture of icing sugar and cornstarch in a 1:1 ratio. In this case you will mix 2 teaspoons icing sugar with 2 teaspoon cornstarch and use exactly as described in the recipe. 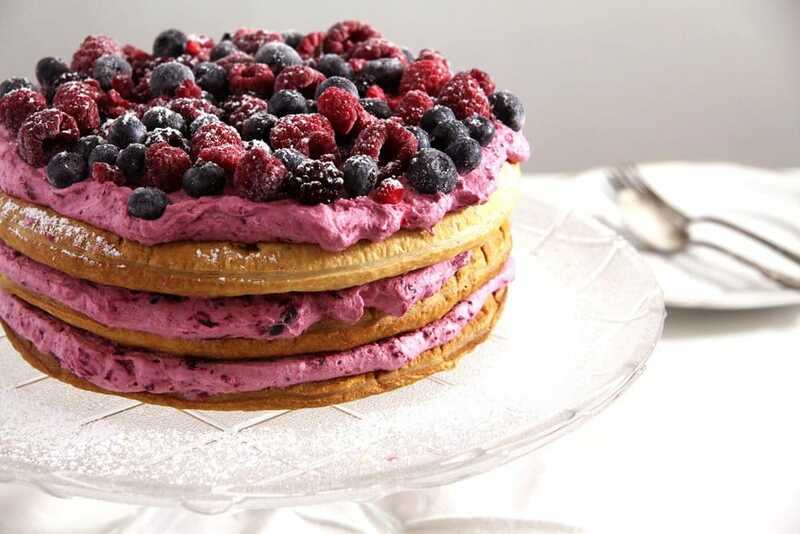 Fresh berries would be the perfect choice to top the cake, but for the filling do use the frozen ones, they are so much cheaper, they taste good and you will cook them to puree anyway. I used a mixture of frozen blueberries, raspberries, blackberries, red currants and strawberries. Set 150 g/ 5.3 oz of the berries aside, if they are frozen leave them in the freezer. 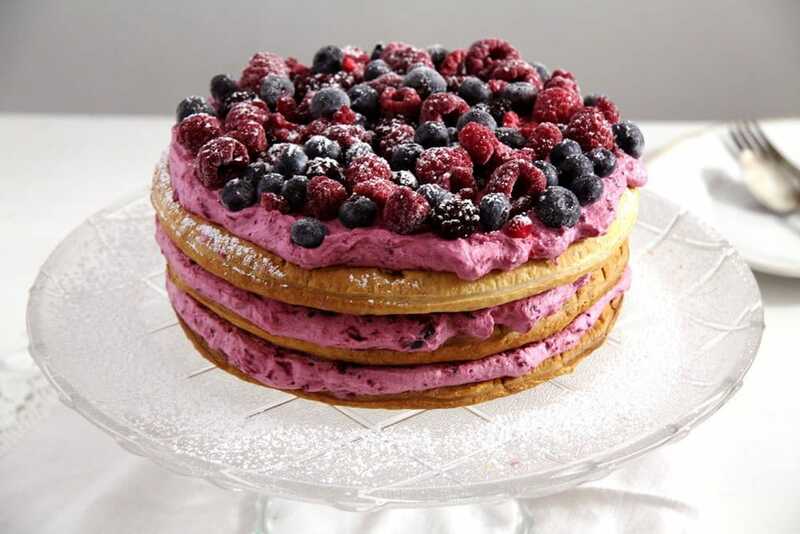 The best solution would be to use frozen berries for the filling and fresh ones for the topping. However, if fresh are not available, you can still take the frozen ones for the topping as well, thaw them on kitchen paper which will absorb as much water as possible and place them on the cake just before serving. Place the rest of the berries in a medium pan, add the sugar, mix well and bring to a light simmer. Let simmer, uncovered, for about 30 minutes or until most of the water has evaporated and the mixture has the consistency of a thick apple sauce. Let get completely cold. Preheat the fan oven to 180 degrees Celsius/ 360 degrees Fahrenheit. It is better to use a fan oven, which will allow you to bake all the 3 baking trays with the puff pastry at once. Otherwise, when using a normal oven, you will have to bake one puff pastry circle after another. In the meantime take the puff pastry out of the fridge. If frozen, let stand for 10 minutes. If not frozen, you can start immediately. Cut three 24 cm/ 9.4 inches circles out of the pastry. I had two sheets of pastry, I cut one circle out of each of them, rolled together the rests and cut a third circle. I used the bottom of a 24 cm/ 9.4 inches springform, which I laid on the pastry and cut around it with a sharp knife. You could use a plate of a similar size as well. Place each pastry sheet on a baking tray lined with baking paper. Pierce the puff pastry circles with a fork all over to prevent them from puffing up too much. Bake the pastry circles for about 20-25 minutes or until nicely golden. If they puff up too much, press down the risen parts after the pastry has cooled down. Transfer the pastry on wire racks and leave to cool completely. When the pastry is cold, whip the double cream adding the cream stabilizer according to the packet's instructions. Fold in the berry puree, taste and add a little bit of icing sugar if not sweet enough. Place one puff pastry circle on a serving plate. Spread 1/3 of the cream-berry mixture on top. Continue in the same manner with the remaining pastry circles and cream-berry mixture. Top with the remaining berries and dust with some icing sugar just before serving. 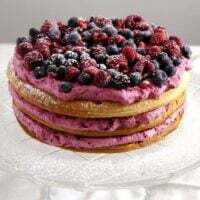 If the berries used for the topping are frozen ones as well, spread them on kitchen paper and leave them to thaw slightly before topping the cake. Keep the cake refrigerated until ready to serve. To cut the slices it is best using an electrical knife, which will allow you to cut nicer, cleaner slices. Cream stabilizer is not always necessary, you will have to decide yourself if the whipped cream is stable enough or not. Cream stabilizer can be replaced with a mixture of icing sugar and cornstarch in a 1:1 ratio. In this case you will mix 2 teaspoons icing sugar with 2 teaspoon cornstarch and use exactly as described in the recipe. 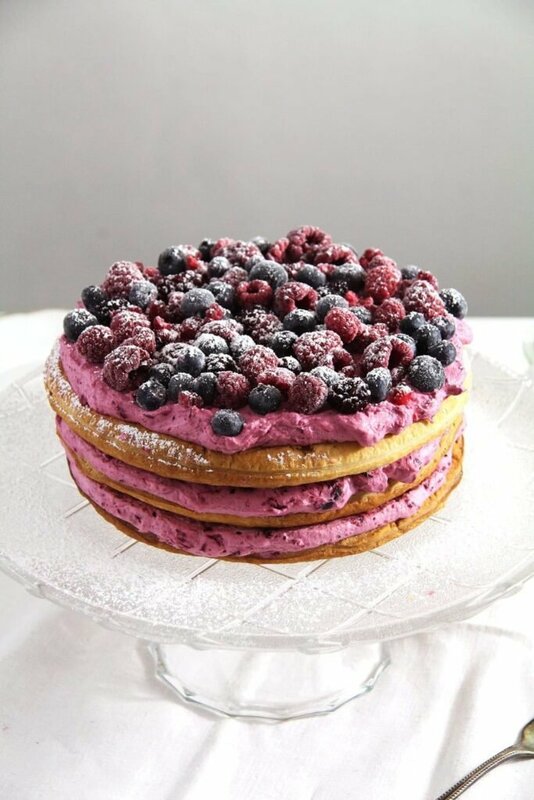 Such a stunning berry dessert! Purple makes everything so much prettier and tastier, doesn’t it? oh my would love a piece of that cake!!! I am not a fan of valentines day although I look forward to all the mushy movies they show…. I dont think to show you love some one has to be singled out to just one day, right? Love that cake !!! I mean seriously look at all those berries!!! This is SO pretty! I completely agree about Valentine’s day. I actually beg my husband to not spend money on those overpriced roses that die in a day! I wish he would make this for me instead! Wow, looks amazing! Being a hopeless romantic, I love the sentiment behind Valentine’s Day and think this would be a delicious way to celebrate! Un postre magnífico y bello para cumpleaños una verdadera delicia algún día haré esta maravilla,abrazos. This cake is gorgeous! I love that it’s made with just a few simple ingredients and juicy frozen berries. Don’t have a lot of puff pastry experience (even with the frozen kind) but I actually feel like I could make this 🙂 BTW enjoying your overall theme this year, I love reading about your grandmother and childhood in Romania. Adina, this cake is just gorgeous! 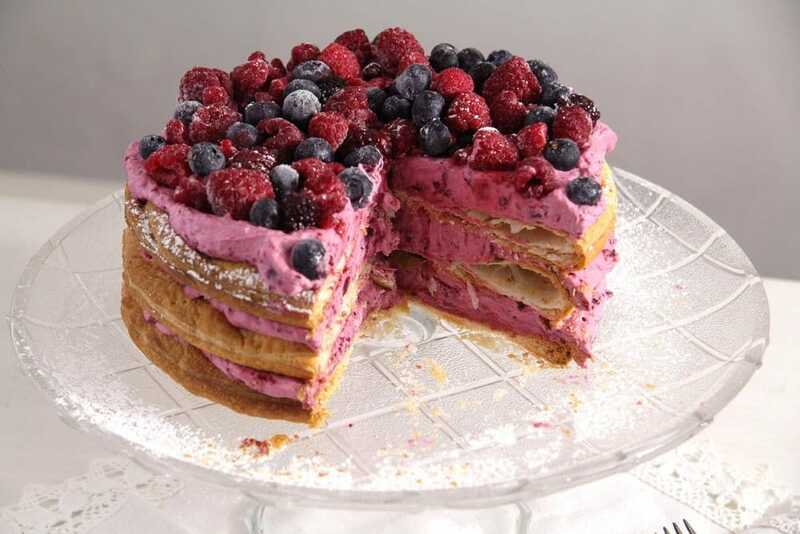 The flaky layers and that beautiful berry cream! Sweet how your grandmother was so pleased with her freezer. My grandmother had the same – minus the lace table cloth! I remember she would make lots of apple pies from my grandfather’s apple trees and pull one out when we came to visit. Lovely memories!